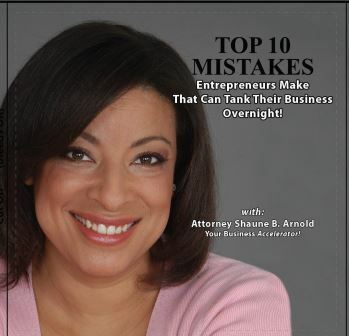 The Top 10 Mistakes Entrepreneurs Make That Can TANK Their Business Overnight represents the top questions Entrepreneurs have asked me over the last 20 year of practicing Business Law. Now you can "put an attorney in your pocket." With this pre-recorded 8-webinar series you'll put yourself on the road to starting, building or fixing a business that you'll absolutely LOVE!